Captain Joshua Slocum is North America's best-known sailor. In 1998 was the 100th anniversary of his completion of the first recorded single-handed voyage around the world. In 1898, most Americans were excited about the war with Spain and his feat did not receive much publicity. As the out-of-work captain sailed to new lands (without the grants, commercial sponsors, and electronic gear many expect today), a common question was, "But will it pay?" The main Joshua Slocum Society page is the central point. An abstract with photographs of a May 1998 article in Scientific American is also online. Voyage of the Liberdade [200KB]--Description of a Voyage "Down to the Sea", Boston: Press of Robinson & Stephenson, 1890, 1894. Boston: Roberts Brothers, 1890, 1894. Reprinted in Outing magazine, November 1902-1903, with minor changes, under the title The Voyage of the Aquidneck and its Varied Adventures in South American Waters. See the arthur-ransome.org online version. Voyage of the Destroyer from New York to Brazil . [62KB] Boston: Press of Robinson Printing Company, 1894. Of 500 copies printed, three are now known. Sailing Alone Around the World , New York: Century Publishing Company, 1900. Illustrated by Thomas Fogarty and George Varian. Reprinted almost annually by Century, then printings by Blue Ribbon Books, Sheridan House, and Grosset & Dunlap from the original plates. Reprinted by Dover Publications in an inexpensive paperback. London: Sampson Low, Marston & Company, 1900. Abridged, 1903, Charles Scribner's Sons, with a preface by the author. Parts of the book first appeared in The Century Illustrated Monthly Magazine from September 1899 to March 1900. The following biographical information is based on information supplied by Walter Magnes Teller ( The Voyages of Joshua Slocum , 1958, ISBN 0-911378-55-3; The Search for Captain Slocum , 1956, Charles Scribner's Sons), and Victor Slocum, his son ( Capt. Joshua Slocum: the Adventures of America's Best Known Sailor , 1950, ISBN-0-924486-52-X). 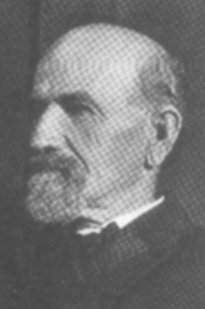 Captain Joshua Slocum was born in Nova Scotia. The family's name was originally Slocumb or Slocumbe; they had left Massachusetts at the time of the rebellion against the Crown. He went to sea at age 16 and became an American citizen in 1869 and Captain Slocum at age 25. He married Virginia Walker in Australia and sailed with her and their family aboard large merchant craft and square-rigged ships in the Pacific. In 1881 he assumed command of the Northern Light , a beautiful tall-masted ship (but not the clipper ship of that name, as the days of the American clipper ships was over). Joshua never fully recovered from Virginia's death in 1884, although, lonely, he married a first cousin, Hettie, in 1886. In a few years, the days of sailing ships ended and Slocum was essentially without a berth in a day of new technology. His first book is the story of a shipwreck in South America, whereupon Slocum built a 35-foot junk-rigged craft and sailed home with his wife and children. It was the last voyage for Hettie. The Liberdade was placed in storage but has not been found. The second book tells of the delivery of a warship to South America, for which he was never paid. The first edition of this book has become exceedingly rare. Slocum's solo circumnavigation, as he describes for himself in his third book, was well planned. He had arranged for his publisher, Roberts Brothers, to stock his cabin with reading material, and more were added by encyclopedia publisher Adam Wagnalls (whose work has been the basis of Microsoft Encarta ), and Wagnalls's 24-year-old daughter, Mabel, who is the one who said, "The Spray will come back." Slocum had admired the recent travel books of Robert Louis Stevenson and Mark Twain. 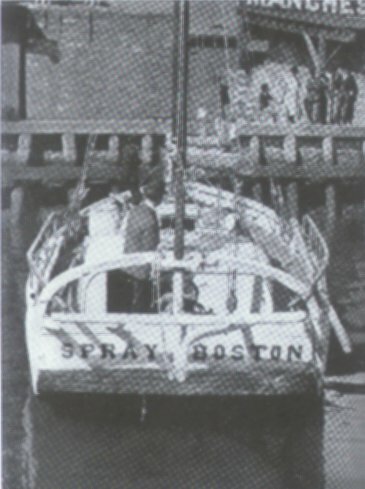 In 1901, Slocum took the Spray to the Pan American Exposition in Buffalo and finally was able to buy a farm in West Tisbury, a town on the island of Martha's Vineyard, Massachusetts. He sailed the Spray to the Caribbean. In 1906, on the way back, in Riverton, New Jersey, he was convicted of what we would term indecent assault on a 12-year-old girl and discharged without further action. Slocum and the Spray were growing old. Planning a voyage up the Amazon, Slocum set sail from Vineyard Haven on November 14, 1909, but he and his little ship have not been seen since. A few years later, his wife had a court declare him legally dead as of that date.